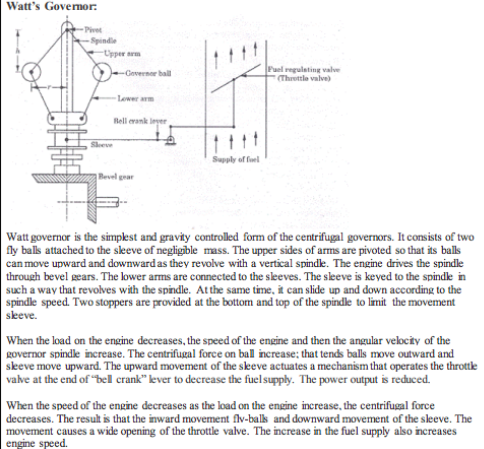 Explain the working of Watt governor with neat diagram. 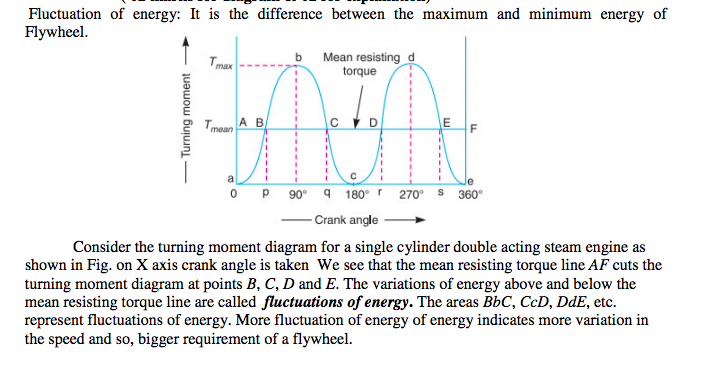 Explain the working of flywheel with the help of turning moment diagram. A flywheel used in machines serves as a reservoir, which stores energy during the period when the supply of energy is more than the requirement, and releases it during the period when the requirement of energy is more than the supply. The fluctuation of energy may be determined by the turning moment diagram for one complete cycle of operation. Consider the turning moment diagram for a single cylinder double acting steam engine as shown in Fig. 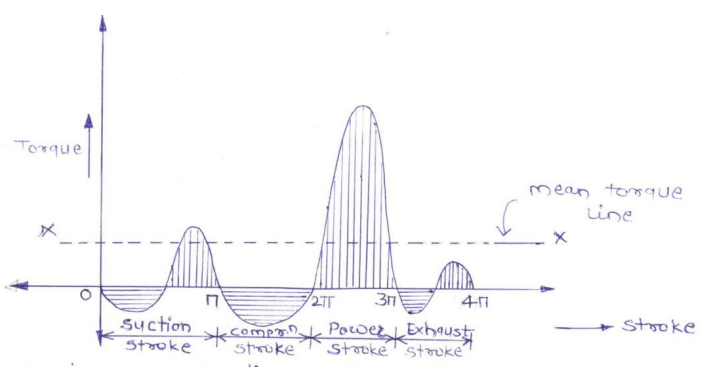 We see that the mean resisting torque line AF cuts the turning moment diagram at points B, C, D and E. When the crank moves from a to p, the work done by the engine is equal to the area aBp, whereas the energy required is represented by the area aABp. In other words, the engine has done less work (equal to the area a AB) than the requirement. This amount of energy is taken from the flywheel and hence the speed of the flywheel decreases. Now the crank moves from p to q, the work done by the engine is equal to the area pBbCq, whereas the requirement of energy is represented by the area pBCq. Therefore, the engine has done more work than the requirement. 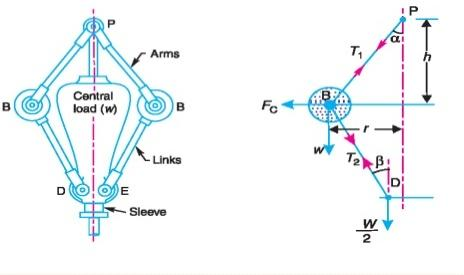 This excess work (equal to the area BbC) is stored in the flywheel and hence the speed of the flywheel increases while the crank moves from p to q. Similarly, when the crank moves from q to r, more work is taken from the engine than is developed. This loss of work is represented by the area C c D. To supply this loss, the flywheel gives up some of its energy and thus the speed decreases while the crank moves from q to r. As the crank moves from r to s, excess energy is again developed given by the area D d E and the speed again increases. As the piston moves from s to e, again there is a loss of work and the speed decreases. The variations of energy above and below the mean resisting torque line are called fluctuations of energy. The areas BbC, CcD, DdE, etc. represent fluctuations of energy. Define following terms : Fluctuation of energy, co-efficient of fluctuation of energy, co-efficient of fluctuation speed, maximum fluctuation of energy. Fluctuations of energy: The variations of energy above and below the mean resisting torque line are called fluctuations of energy. Coefficient of fluctuation of speed: The difference between the maximum and minimum speeds during a cycle is called the maximum fluctuation of speed. The ratio of the maximum fluctuation of speed to the mean speed is called the coefficient of fluctuation of speed. State the function of flywheel in I.C. Engine. A flywheel used in machines serves as a reservoir, which stores energy during the period when the supply of energy is more than the requirement, and releases it during the period when the requirement of energy is more than the supply. In other words, a flywheel controls the speed variations caused by the fluctuation of the engine turning moment during each cycle of operation. State the function of governor. 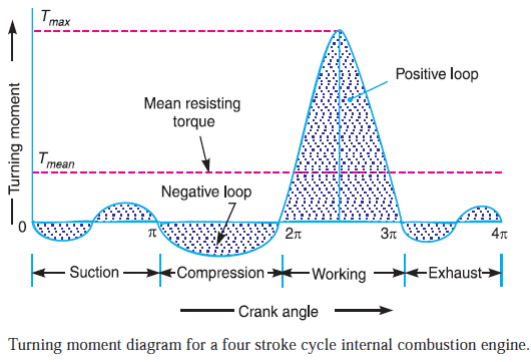 Draw turning moment diagram for single cylinder four stroke I.C. Engine. Define: (i) Coefficient of fluctuation of speed. (ii) Coefficient of fluctuation of energy. (i) Coefficient of fluctuation of speed: Coefficient of fluctuation of speed is defined as the ratio of the maximum fluctuation of speed to the mean speed. It is denoted by C s.
(ii) Coefficient of fluctuation of energy: Coefficient of fluctuation of energy may be defined as the ratio of the maximum fluctuation of energy to the work done per cycle. It is denoted by Ce. Ce = Maximum fluctuation of energy/ Work done per cycle. 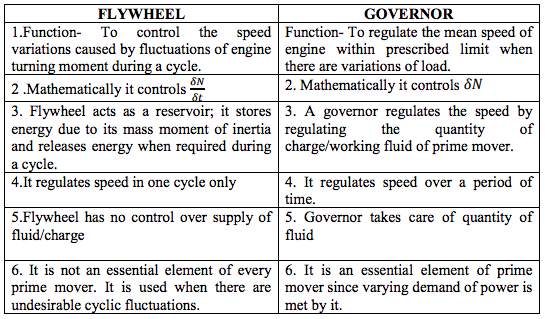 Differentiate between flywheel and governor. Define fluctuation of energy and coefficient of fluctuation of energy. Distinguish between flywheel and governor. State the function of Governor in an I.C. engine. 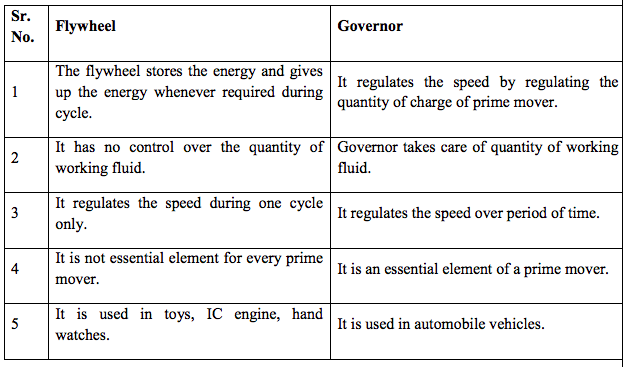 The function of a governor is to regulate the mean speed of an engine, when there are variations in the load e.g. when the load on an engine increases, its speed decreases, therefore it becomes necessary to increase the supply of working fluid. On the other hand, when the load on the engine decreases, its speed increases and thus less working fluid is required. The governor automatically controls the supply of working fluid to the engine with the varying load conditions and keeps the mean speed within certain limits. State four applications of flywheel. Applications of flywheel : Used in Internal combustion engines, press machines, mills, punching machines. 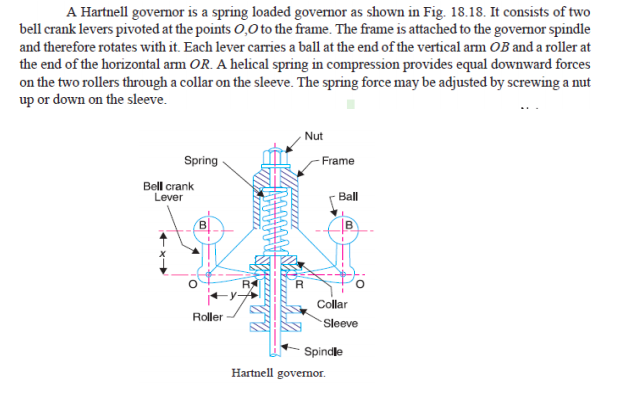 Explain with sketch working of hartnell governor. Explain the concept of fluctuation of energy related with turning moment diagram with sketch. State the function of flywheel in IC engine. A flywheel controls the speed variations caused by the fluctuation of the engine turning moment during each cycle of operation. A governor is said to be stable when for every speed within the working range there is a definite configuration i.e. there is only one radius of rotation of the governor balls at which the governor is in equilibrium. For a stable governor, if the equilibrium speed increases, the radius of governor balls must also increase. A governor is said to be hunt if the speed of the engine fluctuates continuously above and below the mean speed. This is caused by a too sensitive governor which changes the fuel supply by a large amount when a small change in the speed of rotation takes place. 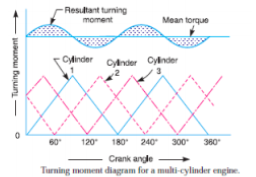 Draw turning moment diagram for single cylinder four stroke I.C. Engine. Label all parts.